You are children but I do not view you as children. Indeed you are the youth of tomorrow. You are the future champions of Islam. Submit your essays and photos to albashir@atfalusa.org. Check with your Nazim Atfal for essay topics. 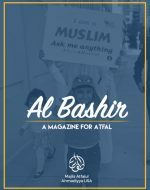 Al Bashir is a bi-annual publication of Majlis Atfal-ul-Ahmadiyya USA. 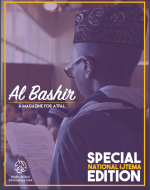 The purpose of this magazine is to highlight and share the activities of the Majlis from the perspective of our Atfal. By the grace of Allah, Majlis Atfal-ul-Ahmadiyya has published two issues of Al Bashir.